All Ages & All Events! If you are looking for a Magician for the Raleigh, NC area or beyond - Chris JuggleBoy Fowler has a fun and exciting Magic & Juggling Show that is great for All Ages! Chris has performed his Magic Show as a Birthday Party Magician, Company Party, Picnics, Churches, Upward Magicians, etc. Magicians offer a great addition to any party. People enjoy watching Magic Shows as part of your event. 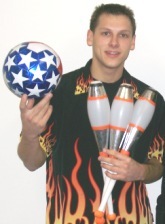 We hope you will consider Chris Fowler and his Magic and Juggling Show for your party guests to enjoy! ENTERTAINERS - Magician, Magicians, Magic Shows, Juggler, Jugglers, Juggling, Magic and Juggling Show, Stilt Walker, Stilt Walkers, Balloon Artists, Balloon Sculptures, Balloon Art, Balloon Animals, Balloon Twisters, Upward Speaker, Upward Entertainers, Upward Juggler, Upward Magician, Birthday Magican, Variety Show, etc. Magician based in Raleigh, NC - WILL TRAVEL TO ANY AREA - Cary, NC Magician; Durham, NC Magicians; Chapel Hill, NC Magician; Greensboro, NC Magic; Rocky Mount, NC Magic Show; Charlotte, NC Magicians. SC Magicians, VA Magic Show, FL Magician, GA Magic, TN Magician, OH Magicians, and beyond! Thank you for considering us for a Magician for your event!